Completely made in Italy but used in the entire world, Arduino is one of the most famous existing single-board microcontroller, it allows us to execute a lot of operations and so it is largely used in the development and prototyping of various devices. One of the possible application that we can make of Arduino is to use it as a converter: we can convert the Play Station 2 controller into a fully compatible PC or PS3 controller. WARNING: this tutorial is to be considered for illustrative purposes only. We don’t assume any responsability for any possible damage caused. Arduino Uno (Leonardo and Mega are also good): if you haven’t already bought it, and you want only to convert your PS2 controller, don’t do it. Converters are avaiable on the net (especially eBay) for few bucks. Library/firmware UnoJoy: you can download it from Google Code, selecting your OS and your Arduino model. PS2X library: created by Bill Porter, it is avaiable for download from his site (there is a “Download PS2X” link). And, of course, a PS2 controller that you no longer need (it is advisable to cut the connector, even if you can avoid it). A little opening warning: the vibration won’t work (it requires the use of transistors). FIRST STEP: let’s do the wiring! It’s good to know that the PS2 controller has 9 wires (or 8, for the latest) that could differ in color. Green: acknowledge, it is used in communication between controller and PS2, we don’t need it. BLACK: it is the common ground cable. RED:it is the positive DC supply (3.3V). BROWN: it is the data cable used by the controller to send data to the Play Station. 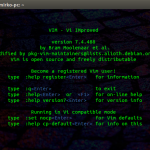 ORANGE: it is the “command”, used by the Play Station to send commands to the controller. BLUE: it is the clock, we use it for establishing the correct data transmission speed. Well, now we have to make the wiring: take the breadboard and the 10kOhm resistor and let’s start. These are the connections that we need and as you can see they are pretty simple. I have also made a Fritzing scheme (the green water is the orange wire). So, we have to take a wire, strip it and wrap the conductive material around one side of the two jumpers (leaving the other free) and put it on the breadboard. Repeat this operation for all the used wires (they are six) leaving between them 2 free breadboard holes to avoid short circuits. Then link the wires following my same order (black, red, brown, orange, yellow and blu) to avoid bad connections. Take the black cable on the other jumper side (the one we left free) and link it to one of the GND PINs on Arduino. Then take the 10kOhm resistor and put it on the breadboard (as in the images) and connect the red wire to one resistor side and, with another jumper, connect in series the 3.3V (on the same resistor side, check images if you haven’t understood). On the other resistor side, connect the brown cable (in my image, it is the green jumper) and in series connect it to PIN 11 (watch the scheme). After that, connect the orange wire to PIN 9, the yellow one to PIN 8 and the blue one to PIN 10. We have finished the wiring! Now we arrived to a crucial point: the Arduino program coding! Open the Arduino IDE and import the PS2X library (that we already downloaded and unpacked). We have to click Sketch >> Import Library >> Add Library and then select the folder PS2X_lib. Ok, now open the UnoJoy folder (or LeoJoy or MegaJoy). There is a folder called “UnoJoyArduinoSample“, that contains a .ino and a .h file, copy and paste it and rename the duplicate file just created as you like, I called it playstation. // pulled low when pressed, we use the "!" // And return the data! After that verify and upload it to Arduino. If there are problems during the compilation, for a missing folder, try to do Sketch >> Import librery >> PS2X_lib. If the compiler continues to give you errors, try to look for the problem and send a comment: I’ll be happy to help you! Well, save and close the IDE and open the UnoJoy folder. There is a subfolder named “UnoJoyProcessingVisualizer“, open it and run the executable file. A windows will pop up showing a joystick: select the right COM port and test if the controller is working properly. If no, chek the wiring! We arrived at the last step: the most decisive. I want to remember that I won’t assume any responsability for any damage caused and I would like to specify that this is a risky operation that can harm your Arduino (it couldn’t work anymore). 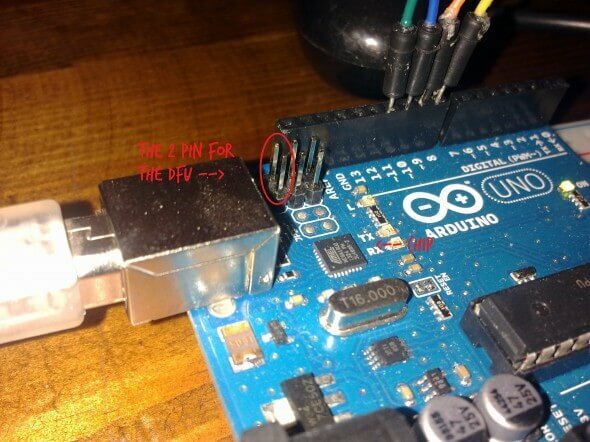 The Arduino DFU mode requires sometimes a modification to the chip consisting of the addition of a resistor, I suggest you to inform yourselves about the DFU mode of your Arduino’s model before proceeding. First thing you have to do is to install the drivers (they are in the Drivers folder), then, if you use windows, you have to install Atmel’s FLIP. Next, you have to put Arduino in DFU mode (at your own risk). You can do this by shortcircuiting the 2 pin nearest the USB (see the picture). After that, your Arduino should be recognized as Atmega16U2 (or Atmega8U2). If it won’t try reinstalling the drivers. In the DFU mode, open the UnoJoy folder and execute TurnIntoAJoystick. After few seconds you have to press a key (as requested) and next you have to unplug and replug the USB cable. Now your PS2 controller is working also on PC and PS3! The Axis works also well, of course. 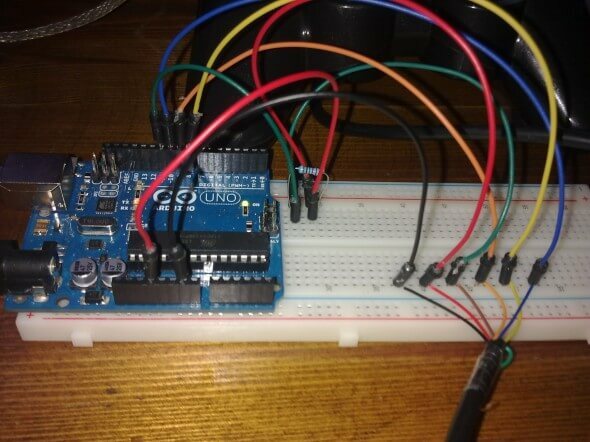 When you want to turn back to Arduino, the only thing you need to do is to put the Arduino in DFU mode, execute TurnIntoAnArduino (into UnoJoy folder), wait for few seconds and then reconnect the USB: Arduino is back! Don’t hesitate to comment if you have problems, we will try to resolve them! Usare joystick PS2 sul PC e sulla PS3 con Arduino. © 2019 TecnoMente. All Rights Reserved.